Legrand's 331-5310-LEG Small Form Factor Pluggable (SFP) transceivers are compatible with the Small Form Factor Pluggable Multi-Sourcing Agreement (MSA). 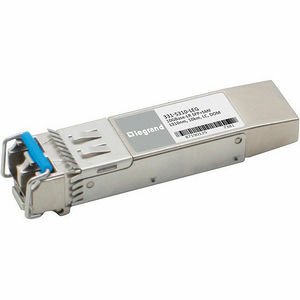 The SFP+ transceivers are high performance, cost effective modules supporting dual data-rate of 10Gbps and support distance up to 10km with SMF. ESD to the Electrical PINs: compatible with MIL-STD-883E Method 3015.7. ESD to the Duplex LC Receptacle: compatible with IEC 61000-4-2 GR-1089-CORE.